HIE and consultants GVA Grimley unveiled a vision of how a five hectare site could be developed at John O'Groats in September 2009. The masterplan, which was shaped by the views of residents, businesses, tourists and public agencies, offers various design options. Four development phases have been identified, with phase one being the 'most critical'. It incorporates the restoration or replacement of the John O'Groats Hotel, a new harbour square, refurbishment of the Last House Museum and the restoration of coastal paths to Duncansby Head and to the John O'Groats Mill. Additional phases would see the building out of Market Street, additional restoration and renovation of commercial and residential units, the possible relocation of the craft village, creation of more car parking and creation of a new hotel. The top option also adds a market street and square, with car parking on the periphery. The consultants highlighted the need for good quality building design from locally sourced natural materials and recommend a build sensitive to the landscape and reminiscent of a typical Scottish coastal village. 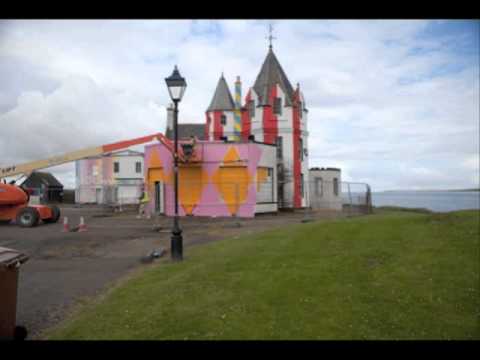 HIE investment triggered the £6m transformation of John O’Groats.